Outlook 2010 Training Materials are designed to develop employees’ knowledge of Outlook 2010 in the workplace at a foundation level. Confidently train staff what Outlook is, types of email accounts, about Outlook folders, how to customize the interface and more! Seeing is Believing This sample manual to teach Outlook 2010 - Foundation is in MS Word format. Staying connected with colleagues, customers, clients, and employees through email is essential to remaining up to date with business and organizational activities. Outlook 2010 enables users to access a personal calendar, create, send, and manage e-mail, manage an address book, keep track of their to-do list and schedule appointments. Making sure that your personnel is taking advantage of these features is the best way ensure positive communication results. 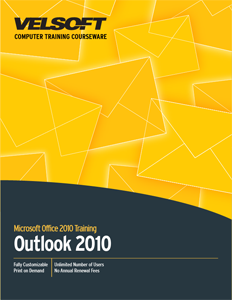 Outlook 2010 Training Materials provides employees with a comprehensive learning resource to maximize their capabilities using the program. Outlook 2010 Training Materials will ensure that instructors and students can easily follow the flow of information; step by step. Even through the most advanced applications of Outlook 2010, employees and instructors can easily navigate the sections of the course. Instructors can progress with training at a comfortable rate for the class. Students are able to understand the new information, before moving on to the next section. The different components of Outlook are all integrated, meaning you can use your contacts to address an e-mail, track all contact with a particular person, or send your community group tasks. The results of training for Office Outlook 2010 will be evident, as an increased awareness of the importance of communication is brought about from using the product.